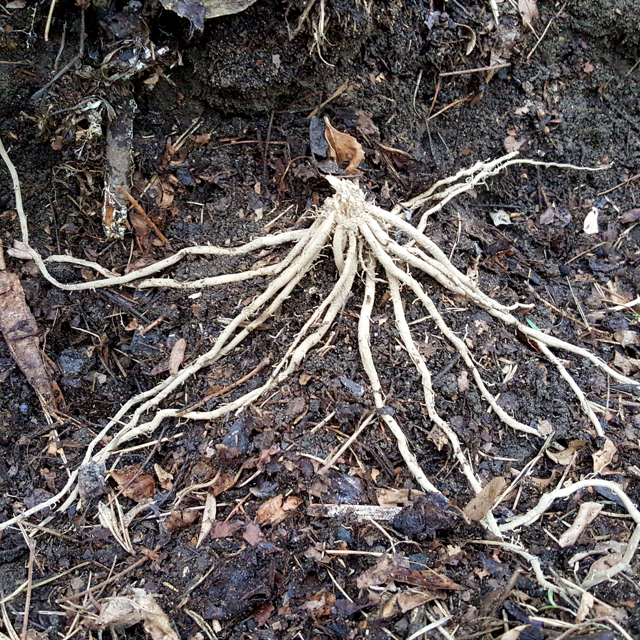 One of three asparagus plants that survived winter. Last summer Jay and I were very busy in our backyard, and built some raised beds well after the chicken coop was complete, sometime in July. 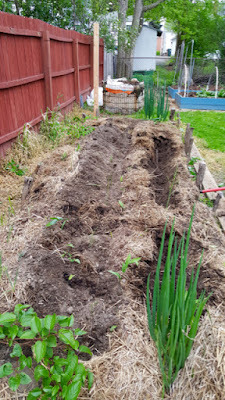 While I had purchased 20 crowns of asparagus early in the spring, I didn't get around to putting them in the ground until mid-summer. All but a few came up and I diligently packed dirt around the new shoots as they grew out of the soil. 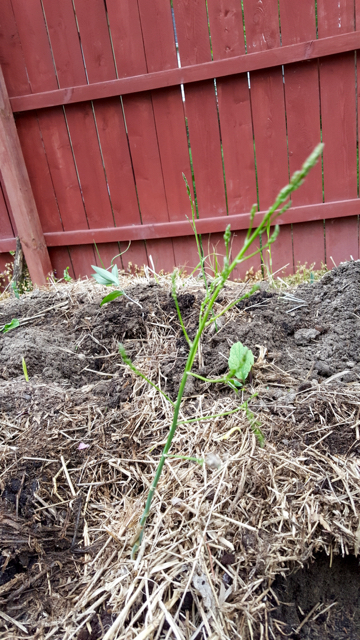 I covered the whole thing with hay mulch in autumn and this spring, I waited eagerly for the asparagus to return. Unfortunately, only three plants returned. I suspect it's because I planted them so darn late in the season, they didn't have enough time to build roots to survive the winter. As I was digging news holes for this year's plants, I uncovered one of the old crowns. 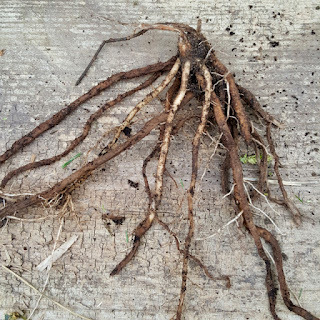 Most of it was dead, but you can see below three white roots that seemed to be alive. I wonder had I not dug it up if this would have survived. I found a few other crows too, but they were entirely wilted and starting to rot. One of last years crowns showing a little bit of life. Newly dug trench for this year's crowns. So this year I dug the trenches a little deeper, put a little more compost in the holes, and planted them in May. 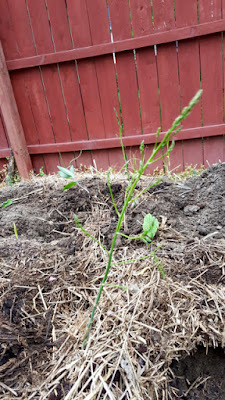 I'm looking forward to a vibrant asparagus crop for years to come. A happy new crown, planted deeply, and at the right time of the year! by John Updike, from Telephone Poles and Other Poems (Alfred A. Knopf).